National Tank Outlet is known nationwide for our heat trace and insulated tanks. We offer years of experience to help you pick the right option for you. Our plastic vertical tanks ranging from 200 to 16,500 gallons are the most common used for heat trace and insulation. 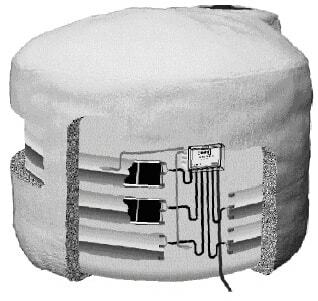 We can also heat trace and insulate our double wall tanks, cone bottom tanks, and more. Our systems allow you maintain a set temperature for your stored liquid. The system consists heat tracing applied to the lower part of the tank, electronic control box, and 2” of polyurethane foam with painted weather resistant mastic coating. We can add fittings, external down fills, flanges, sight gages, level sensors, ladders, tie-down systems, and more. Our heat trace and insulated tanks can be used for indoors or outdoors. Some of the most popular liquids stored in our heat trace and insulated tanks are sodium hydroxide or caustic, potassium hydroxide, and water. Heat Maintenance Systems are be designed to meet specific requirements such as tank material type, tank size, low ambient temperature, and desired maintenance temperature. All control components of the heating system are mounted in water tight, high impact plastic box with a gasketed cover. All our heat trace system components are factory pre-wired for 110 VAC. Each control box shall carry a decal attached to the inside surface of the cover, on which an electrical wiring diagram will be printed. Each control box shall contain two temperature controls. One control shall regulate the maintenance temperature setting and the other control shall regulate the high temperature setting. The maintenance temperature setting should be set at the desired maintenance temperature. The high temperature setting shall be adjusted to 10 degrees above the desired maintenance temperature to a maximum of 130 degrees Fahrenheit. The heating panels shall be designed to wrap around and lie flat against the surface of the tanks. Insulation used is a polyurethane foam with a density of 2.0 - 3.0 lb./ft3 with a "R" value of 8.33/in. The foam shall be applied with a nominal thickness of 2" to all external tank surfaces except the tank bottom shell. Upon completion of application and curing of the insulation, two full coverage coats of latex mastic coating are applied to the surface of the insulation in such manner as to seal the insulation from the outside environment. The latex mastic can be ordered in white ( standard ) or grey in color. Please feel free to contact our sales staff with any questions.